Disclaimer: This is not going to be a very good review. We'll just say that up front. We wrote this when sick, when it felt like our brain had a light fuzz on it, much like jam gone bad. Ughh. Woe. We also watched this film with the most excellent Memsaab, so we were more interested in happily chatting away than picking up any filmmaking nuances. Who knows how much we missed. In fact, a better bet would be not to read this review but to proceed apace to Prof. Lutgendorf's review. If instead you'd like a painfully simple and slightly incoherent (our brain = jam gone bad!) review written by a grumpy PPCC, yes, you've come to the right place. We also managed to cap everyone when they were blinking. Anyway. We thought Raj's tired, aging look worked very well, juxtaposing nicely against his inner child. Being naive takes its toll! Yes. As Marx and Engels noted, history has been one long class struggle between the 'Softies' and the 'shrewd-shrews'. And Raj is here to tell you something: 'Softies' of the world unite, you have nothing to lose but your dils! Nutan and the PPCC slowly fall for Raj's bumbling anari-ness. Meet Raj (Raj Kapoor). Raj is just your regular old simpleton, all bright eyes and bushy tail and charming male ingénue-ness. 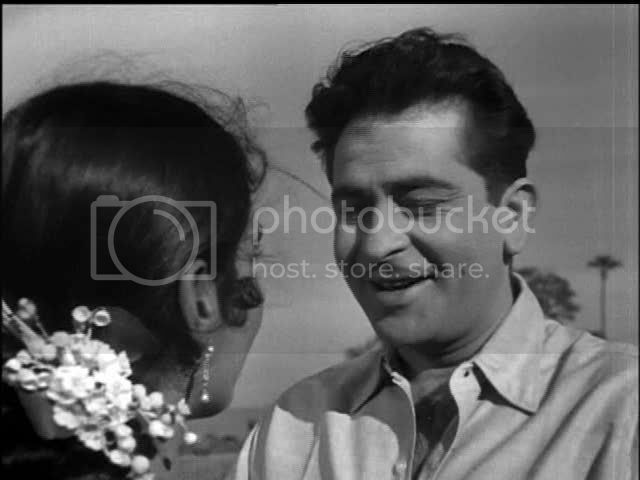 He is a boarder with the irascible, adorable Mrs. D'Sa (Lalita Pawar). Mrs. D'Sa harasses Raj day and night for the rent, and yet in her heart beats a great, big pumping sweetness - she loves Raj as a son, since her own son passed away years ago. Raj, who seems too idiotic to get a job or keep it for very long, is characteristically slow on the uptake. Here then are the two major themes of this film: big, big juicy dil (that is, heart) and stupidity. Well, maybe "stupidity" is a bit harsh. Let's replace that with "naïveté to a lethal degree". Yes, lethal. See melodrama. 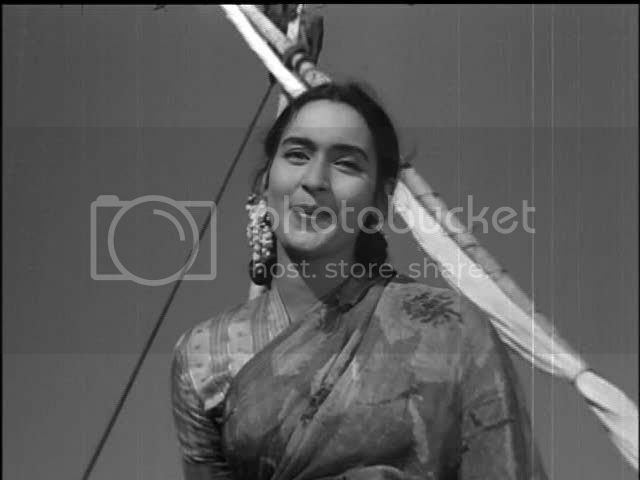 Nutan was FAB in this. But such a liar. Anyway, one day Raj meets Aarti (an awesome Nutan), who is rich, smart and sassy. Aarti, much like the PPCC, is quickly charmed by Raj and, half in jest, she trades places with her lower-class friend and servant, Asha (Shubha Khote) in order to put herself on Raj's level. A courtship begins - and you just know it's not gonna fly because such love never flies for liars. Indeed, in the requisite Hindi Movie Irony, Raj ends up (finally) landing a job with none other than Aarti's uncle (Motilal), a man who likes a hard worker but is not such a fan of having poor folk in the family. And if you foresee disaster already - wait 'til Mrs. D'Sa catches the flu right when a box of poisoned medicine is accidentally at large! Oh no! There's probably some big theme going on about the relationship between cynicism, morality and class matters, but the PPCC is too befuddled to figure it out or care. Onto what we do understand: Raj's histrionics! Crying is important to the PPCC. We like a good cry. Some films - like 1989's Civil War flick Glory - get watched merely so we can have a good cry. We also are easily charmed by actors that can cry convincingly - like Naseeruddin Shah's hyperrealist tears in Monsoon Wedding or Kenneth Branagh's dramatically Welsh Welshness in Henry V. Oh, the humanity! 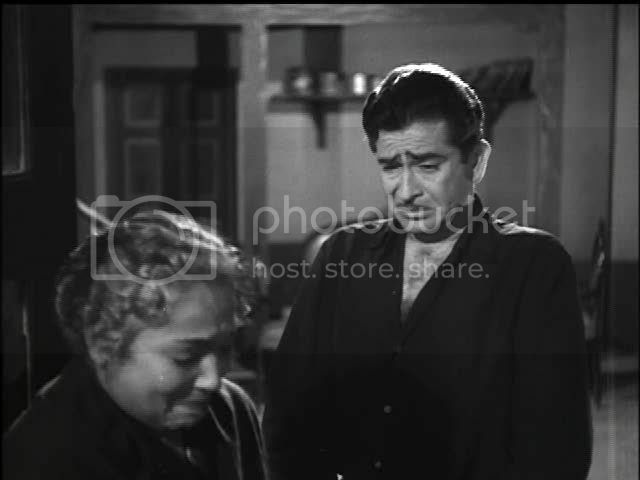 Raj does a lot of good, meaty crying in Anari. Memsaab wasn't as charmed as the PPCC was during Raj's various sniffles, but we found these scenes endearingly open-hearted and satisfying, "Aww, look! He's a 12-year-old boy trapped in a 40-year-old man's body! It's like Big, only with fab songs!" And maybe that's the best way to take Anari. Both your company and this review are more enjoyable than the film (although that says more about your awesomeness than it does about the quality of the film). I did so love Mrs. Disa/D'Sa (the subtitles varied a bit as to her name). She had a lovely juicy dil. 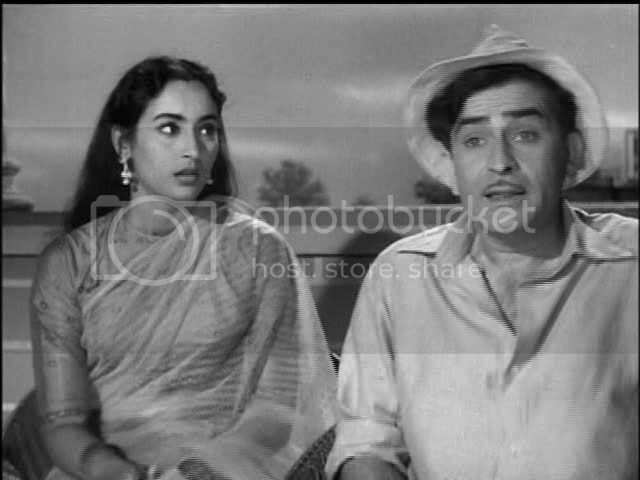 And Nutan the Liar was great as usual. 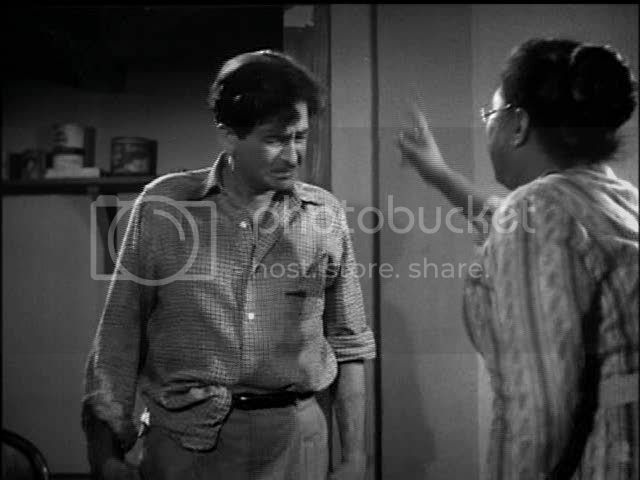 Actually I didn't really even mind Raj so much in this film, although his anari act does get on my last good nerve. But the "shrewd-shrews" rant more than made up for that. And yes: I think that WAS the point of the film. My brain was not fuzzy like jam gone bad, and it's what I came away with. What shall we watch next? And when? That's how I was going to open my writeup of Chor Sipahee. Great. I'm sorry the PPCC has been ill! But the review is fun anyway. Is Nutan related to the girl who played Puja in Chori Chori? They look a lot alike! I love the "Shrewd-shrews", but I don't care much for the character of the man-child in any context, not just Bollywood. Perhaps the charcter was more charming from the vantage point of the 1950s when men were supposed to be MEN than today when popular culture is saturated with men who refuse to grow up. 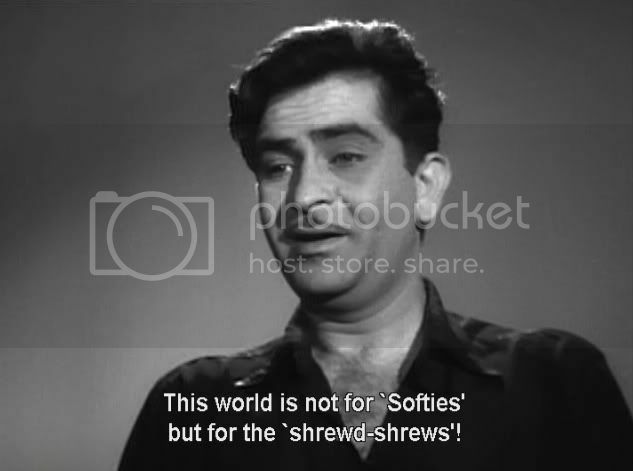 I think Raj Kapoor and I are just fated to remain eternal enemies. love the review, it rocks even with a brain jam. 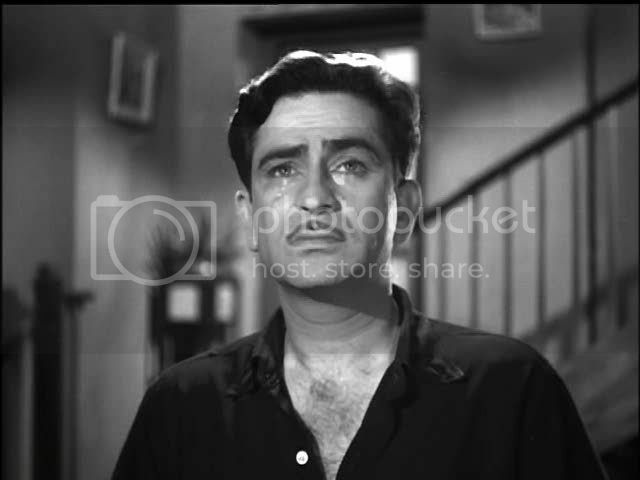 if u want to watch a movie with lots of 'bumbling anari-ness" then watch raj's tribute to his own anari character type in Mera Naam Joker, I loved this movie, but i hated that Nutan lied, she made Raju cry it was puddle-inducing for me! ok i hvnt seen this one from Raj Kapoor but now i surely will...n thnx to ur review, i'll find it funny irrespective of the tear jerker scenes in it..lolz. thankfully music is gud so dats a solace (cant bear movies wid bad music). speakin of music, came across this music networkin portal called Planet Radio City . It talks only about music...so whether its jazz or gazals or rock or sufi or bollywood, you get all news and lyrics and trivia and even videos at one place. i signed up there n its real fun. Have a look. Memsaab - Aw, jeez, thanks, M! Next: Vijeta! Beth - I knew that, and I did it on purpose. My blog has waged war on your blog. Mwa ha ha ha. PPCC khush hui. Ajnabi - *fuzzy brain cannot process* They might be related, but, alas, I don't know. Filmi Girl - No, no. This cannot be. Yeh nahi ho sakta. I will bring you two together, if it means I have to destroy the space-time continuun. I WILL. To begin, Teesri Kasam. Shweta - Can you recommend another good Nutan film? She was indeed fab in this, but I don't know where to go next. Bollyviewer - Hey, but while you can turn subtitles on, I can't turn my Hindi on. Wish I could! Rum - Thanks! I am perversely curious to see Mera Naam Joker - I've been reading a lot of wildly conflicting reviews of it which means, whatever else, it's going to be interesting. Ridhima - Definitely see this, it has so much sweetness you won't need sugar for your tea.